Home / Android / Android App / App / App Review / Game / Game Review / Guess the Movie / Check your level of movie knowledge with Can You Guess the Movie? Check your level of movie knowledge with Can You Guess the Movie? Welcome to the world of guessing movies. Today we present to you the new game app that will keep you entertained and addicted. 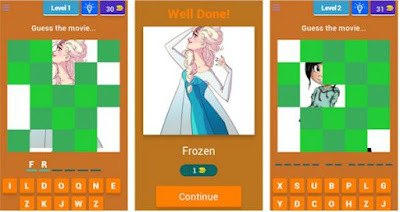 According to the users and their reviews of Can you Guess the Movie, it is one of the most interesting and fun games to play. The developers created a very friendly interface and unique design. With its many amazing features, it will become a part of your day and you can play it anywhere, at anytime. The game has over 100 levels. Each level gets harder and harder, but with every correct answer you will receive coins. With those coins you can remove letters or remove parts of the picture’s puzzle. You will get all kinds of daily rewards and share your scores on Facebook and Twitter. It is full with wonderful sketches, drawings and painting from movies and some anime as well. This brilliant game will keep you busy. Test your level of movie knowledge and show the ones around you how good you are at guessing movies. You can play it with anyone, compete and get high scores on your boards. Download it for free on Google Play. Google Play Download Link: Can You Guess the Movie?